To bestow youth with an unforgettable journey, MM(DU), every year, organize mega youth fest dubbed UniversuMM. The four-day extravaganza gives students a chance to enjoy the joyride of a myriad of events by participating in them and winning lucrative cash prizes. 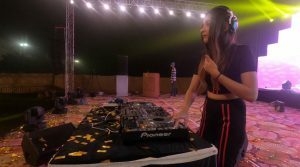 This year, the youth fest marked sensation by leaving the audience spellbound with the grand opening at the MM(DU) campus. Spreading the message of ‘Unity in Diversity’ and ‘Global Peace’, the youth fest was initiated with a colorful procession. Thousands of students descended to the University Campus to witness the best blend of creativity, art, passion, and enthusiasm. MM(DU) Treasurer Dr. Vishal Garg, in the presence of many other dignitaries, commenced the Youth Fest by flagging off. On the day 1, an array of events along with the procession ceremony rocked the stage. 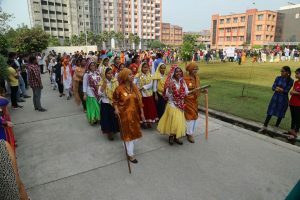 What else would be better to seize the eyes of youth other than the cultural blend of India and other countries during the UniversuMM procession function? I must say one must witness such colorful execution of ‘Unity in Diversity’ once in a lifetime. 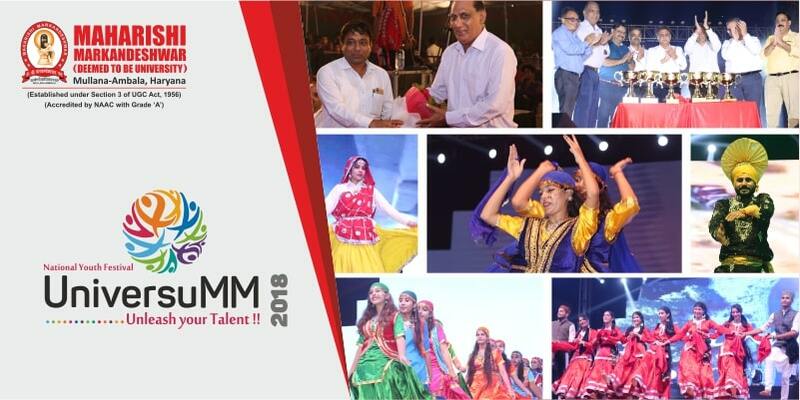 During the function, various departments of MM(DU) stunned the audience with their extraordinary performance, be it the representation of Punjabi culture or Bhutanese, the folk dance of Madhya Pardesh or Haryana, and depiction of love by Bangladesh or Nigeria. Each and every student at MM(DU) along with faculty was flabbergasted to witness such cultural representations. 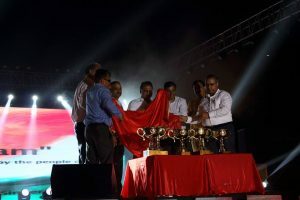 UniversuMM opening ceremony kicked off with the unveiling of trophies for various events. Many dignitaries of MM Trust, including Vice Chancellor MM(DU) Mullana Dr. Victor Gambhir, Vice Chancellor of MMU Sadopur Dr. H.K Sharma, Registrar Dr. Sumit Mittal, Dean Student Welfare Dr. J.K Sharma, and Dean Academic Affairs Dr. N.K Batra joined the event as the Guests of Honor. Welcome song and various cultural dance performances of the UniversuMM inaugural function was an utter treat, as performers mesmerized everyone presents there with their electrifying performances and took the fest to the next level. 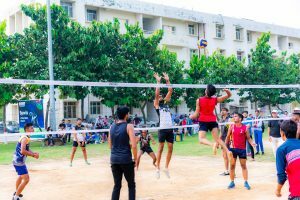 Sports enthusiasts astonishingly exhibited their sports talent in various games that include Cricket, Basketball, Volleyball, Badminton, Squash, Table Tennis, Tug of War, and Chess on the first day of UniversuMM. Participants seemed extremely enthusiastic and energetic to give their best shot and show their potential. Students performed blazingly fast and strategically to grab the title of the winner during the events. Last, but not the least, DJ performance by DJ Audio Addict and DJ Akira set the stage on fire. Waving hands, huge noise, immense pleasure and what not! Words would probably be not sufficient to explain the aura at MM(DU) on the Day 1 of National Youth Fest. Here we’re wrapping a fantastic opening day for the mega youth fest! Stay tuned to catch more on UniversuMM 2018!